* DESTINADO A PERSONAS DESEMPLEADAS CON EDADES COMPRENDIDAS ENTRE LOS 18 Y LOS 34 AÑOS (CON POSIBILIDAD DE HABILITAR HASTA 5 PLAZAS PARA PERSONAS DE MAYOR EDAD, HASTA LOS 59 AÑOS). * PLAZO DE INSCRIPCIÓN ABIERTO HASTA EL 10 DE OCTUBRE. - CENTRO MULTIFUNCIONAL EDIFICO HYTASA (DE 9 A 14 H.). 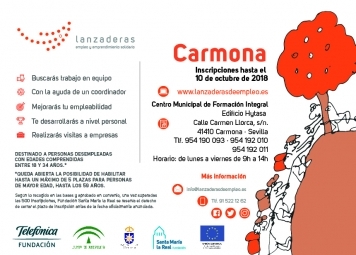 * MÁS INFORMACIÓN EN: EDIFICIO HYTASA, C/ CARMEN LLORCA S/N (CARMONA). TELF. : 954 19 00 93 Y EN EL DOCUMENTO EN PDF ADJUNTO.